Tromgé Tulku Dechen Dorje (1930s-2015) was the grandson of Tertön Sogyal and one of his lineage holders who lived at the Tromgé encampment in Kham, eastern Tibet. He was also a student of the late Arik Rinpoche. With great sadness I want to let you know of the passing of Tromge Dechen Khachod Wangpo Rinpoche, the much-loved and respected master who was the senior lama of Tromge Gompa, and the incarnation of Tromge Terchen Drimed Khachod Wangpo, dharma custodian of Rigdzin Longsal Nyingpo. He was resting in samadhi for a long time, and so lamas in the region advised to keep news of his passing secret; now, however, his parinirvana has been made public. 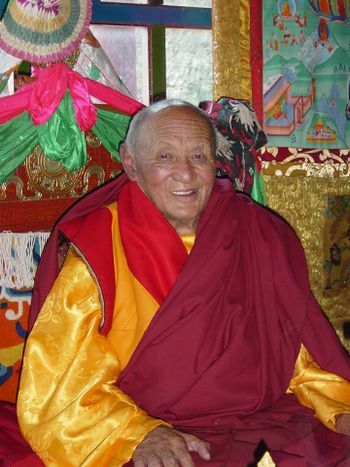 Rinpoche was 90 years old, and we rejoice greatly that he lived so long and touched the lives of so many. Tromge Dechen Rinpoche was the vajra brother of Chagdud Tulku Rinpoche, and in his previous life had been a teacher of Delog Dawa Drolma, Chagdud Rinpoche’s yogini mother. The grandson of Tertön Sogyal (Lerab Lingpa), he was born in Nyarong and came to Tromge Gompa at a very young age. He was viewed as an emanation of Namkhai Nyingpo, one of Guru Rinpoche’s 25 disciples and himself an emanation of Songtsen Gampo, who was Chenrezik manifesting in human form to bring Buddhism to Tibet. Rinpoche was one of the main disciples of the saintly recluse Tromge Tulku Arik Rinpoche, who was famed for his unwavering compassion and ability to tame even the wildest beings. Over the last few decades, Tromge Dechen Rinpoche was instrumental in reestablishing the lineages and teachings at Tromge Gompa, and as the head of the gompa, he was the guide and inspiration for the four throne-holders – Jigme Tromge Rinpoche, Tromge Trungpa Rinpoche, Thrinley Odzer Rinpoche, Tulku Tsultrim Lodro, as well as Tromge Tulku Pema Samten. His realization and kindness drew many disciples from all over the country, who benefited greatly from the wealth of dharma transmissions he carried and generously offered, including the Terton Sogyal Rinpoche transmissions which he offered to His Holiness Khenpo Jikme Phuntsok and the entire sangha at Larung Gar (Serta). On several occasions in the last twelve years, many students from Chagdud Gonpa North and South also had the great good fortune to meet with and receive transmission from Tromge Dechen Rinpoche. The Tromge Drimed Khachod Wangpo Chenrezig sadhana that Chagdud Rinpoche introduced to the West in the 1990s continues to be practiced in various forms at several CGF centers. Tulku Arig Rinpoche said of Tromge Dechen Rinpoche that anyone who connected to him would be led to the pure land at the time of death. ↑ Post from Jigme Tromge Rinpoche's Facebook. This page was last edited on 4 September 2018, at 08:43.